A Battle of the Bands is scheduled Saturday in eastern Iowa, but it’s not between rock bands or even marching bands. This "battle" involves bagpipes. The 11th annual Celtic Highland Games in Davenport will feature dozens of bagpipers and drummers from three of the region’s top pipe and drum corps. Lisa Lockheart is chair of the Games and says this new Battle of the Bands event will put bagpipes in their rightful spotlight. All three bands will be facing off, each playing separate sets with a winner being chosen based on the audience reaction, then all three bands will play together as one giant bagpipe band. Lockheart says the bagpipes are a much-maligned instrument but at this festival, they’re beloved. "There’s all sorts of jokes and quips about bagpipes and what they sound like, but the truth is it’s a highly-developed skill that takes years and years to learn," she says. "There are certain nuances and things that you can listen for that really sets a good bagpiper apart from someone who’s less experienced." The one-day festival celebrates Celtic culture with music, dance, sports and family fun. Workshops are being offered during the day, including one called "Bagpipe Appreciation." There’s also a workshop on how to speak Gaelic (GAY-lick), which Lockheart says isn’t an easy task. "At one point, Gaelic was a dying language but thanks to some efforts to bring it back among the northern part of Scotland and throughout Ireland, it is digging back in and developing more speakers," she says. "Anything we can do to encourage that, we’d like to try." It’s tough to master because many of the letters don’t correspond with sounds Americans are used to — like the word "ceilidh" is pronounced "KAY-lee." A ceilidh is a traditional Irish gathering that features music, dancing and refreshments. 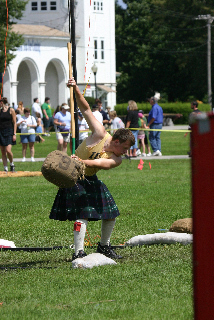 One of the day’s big draws will be the Games of Strength, featuring a variety of athletic events that involve throwing things like large hammers, sacks of grain and heavy rocks. The games will be held at the Mississippi Valley Fairgrounds in Davenport.